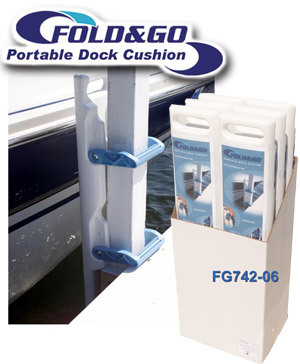 The innovative Fold & Go Portable Dock Cushion is the newest boating “must-have.” Protect your boat from scratching and scraping against rough posts with the durable and portable new Fold & Go. Made of durable polyethylene with ultra-violet inhibitors, this portable dock cushion provides long-lasting protection and resistance to damage and yellowing from sunlight. The handles on the Fold & Go easily fold down to fit over any 4” or smaller round or square post and then fold up in seconds for easy onboard storage. Six Fold & Go Portable Dock Cushions are shipped in a durable shipping box that converts to an attractive point-of-sale floor display. Individual pieces feature a four-color display sleeve with a UPC bar code label. Quantity discounts are available to dealers and retailers for ordering in case or pallet quantities.